Behold the potato. This staple crop, from the high Andes to Europe and then to New England, grounds many a meal. What would Thanksgiving dinner be without a bowl of fluffy mashed potatoes? What would be a burger without the fries, or a summer picnic with no potato salad? Potatoes do double duty as starch and veggie; they provide complex carbohydrates, fiber, Vitamins A & C and potassium. They are filling, wholesome comfort food. We love to grow potatoes at Simple Gifts Farm. Potatoes are one of the earlier crops that we plant, in April when the fields dry out enough to work. We start even earlier, ordering the seed potatoes in February. If we keep them warm in the greenhouse, they will start little sprouts, and then we expose them to light by taking them out of the bags, which makes the sprouts green and harder to break off. This process, called greensprouting, allows us to harvest the first new potatoes at least a week earlier, and also lets the potatoes get that much bigger before the aboveground plants die back in late July and early August. The potato harvest begins in early July, with new potatoes. We aim to harvest some precious pint-fuls of red, white & blue potatoes for July 4. My favorite way to serve the first tiny potatoes is with tender, sweet peas. Later in July, we harvest new potatoes in larger quantities for great summer potato salads. The thin, tender skins and a crisp, waxy texture define new potatoes. Now is the time to harvest the fall potato crop. These spuds have thicker skins and a starchy texture. They keep well under cool, dry conditions, and are a food to sustain us through the cold winter months. These are the aboveground virtues of the potato. 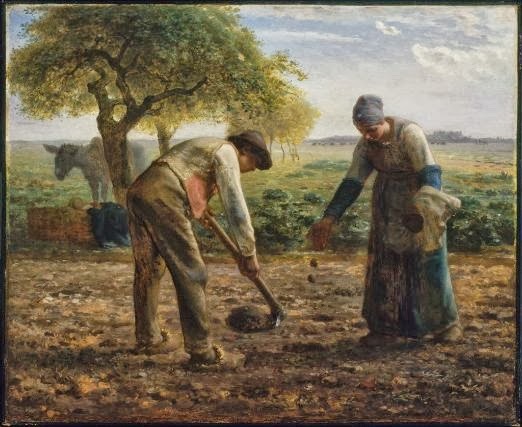 They are dirt-nestled tubers, though, and the potato harvest is an invitation for us to commune with the underground, the soil, and to behold the unseen. Harvesting potatoes is deeply satisfying, at a visceral and maybe even poetic level. Farmkid Jesse’s superhero name is Spudicto. When his sixth grade class received the assignment to write (with inspiration from Neruda) an ode to an everyday thing, his subject was The Potato. So, come join our Second Annual CSA Potato Harvest! Farmer Jeremy will pull the potato digger behind the tractor to loosen the soil and get the potatoes to the surface. The community effort is to gather these potatoes into bags and safely to the barn. Of course, it would be a tease to harvest the potatoes, and not get to eat any. So, we will follow the harvest with a simple lunch of fire-roasted potatoes and chili. When: Saturday, October 26th from 9 A.M. to 1P.M. Bring: Toppings you would like to eat on baked potatoes (if you want—we will have plenty of chili to top them off with). Kids and dogs welcome, but please know you’ll need to keep them back from the machinery.